San Francisco’s waterfront has undergone a massive transformation within the past few decades. Emerging from its murky past of failed projects and crumbling decay, its later commercialization in the 20th century helped shape the shipping aspect of San Francisco’s economy. Although the waterfront’s historic role as a major shipping port tapered off by the early 21st century, it still continues to be a relevant player in San Francisco’s maritime business. Much of what one encounters when strolling along Herb Caen Way and the Embarcadero was ushered in by an earthquake, a new planning policy and regulatory regime, and new approaches to public-sector financing. For decades, the waterfront was shut off, partially barricaded by an elevated freeway, parking, keep-out signs, crumbling piers, and activities and work sites not publicly accessible. Years of failed projects and an extended period of decay set the stage for recent changes along San Francisco's waterfront. Now, in many places and in many ways, people are welcomed to it. This transformation has been guided for the most part by local conditions, from San Francisco's planning culture and environmental activism to the nature of the site itself a beautiful, but shaky, hilly peninsula. Most of the significant changes that have helped define the current lineaments of the port's property north of China Basin Channel commenced in the mid-1990s. What follows is a short discussion of the most important of these, and a very brief outline of key events that have unfolded early in the new millennium. The port's Waterfront Land Use Plan figures prominently in this new era of waterfront transformation. We start, however, with one last status check on the port's shipping operations, once the agency's core purpose. Although the port no longer functioned as an important center for the movement of goods, the agency continued to pursue any new glimmer of hope for maritime business and to protect doggedly what maritime activities it still had. In fact, maintaining a working waterfront is even now a major planning and development goal, and the mantra of many parties interested in the fate of the waterfront. Footage showing the historic role of the San Francisco port in early 20th century trade, and then film of workers along the waterfront loading and unloading ships, moving goods into warehouses, etc., probably in the 1920s. During the 1980s and into the 1990s, the port made efforts to modernize its shipping facilities, spending tens of millions in bond money, but to no avail. The port also sought to underbid its rival in Oakland for shipping lines, but that strategy proved fruitless as well. Between 1995 and 1996, just after millions were spent on upgrades to Pier 80, containerized shipping at the port dropped to a trickle, pushing San Francisco to the bottom of port rankings in the United States. The mid-1990s also saw four shipping lines move to Oakland, including Evergreen and Nedlloyd. It is no surprise, then, that the total number of container units crossing the port's piers dropped precipitously, from about 116,000 to 13,000 between 1991 and 2000. (3) In 1994, the port nearly fell into bankruptcy, averted only by staff layoffs. Although its financial situation improved, the condition of its shipping operations was so bad that the port turned down federal grants to improve a major bottleneck in the transshipment of containers. Modern Intermodal Container Transfer Facility at Piers 94-96 in San Francisco. In distance across bay is the much larger Port of Oakland that handles most container traffic in the Bay. 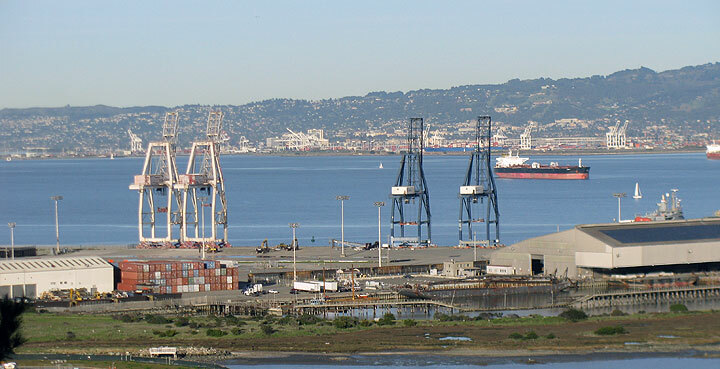 So, the Port of San Francisco cleaves to its working roots as much as it can and involves labor organizations in making decisions about development that may affect existing and potential maritime work. And it continues to evaluate its markets for cargo operations and has devoted resources to a few capital projects. For instance, in 2008, the port dedicated the multimodal Illinois Street Bridge linking the Pier 80 "Omni Terminal" to the intermodal facility across lslais Creek at Piers 94-96. The bridge was a solution to requirements in the Seaport Plan that the port maintain rail access to its maritime facilities in "maritime priority areas." It also helped the port deal with impediments to rail operations due to development at Mission Bay and the construction of the 3rd Street extension of the city's light-rail system. The bridge enables the port to take on heavy-lift cargo jobs and it generally expands marketing possibilities due to increased functionality. Yet in recognition of changed times, the bridge accommodates pedestrians and bicyclists as well. The port has also worked to support the dry-dock operation at Pier 70, which has seen significant increase in business from cruise lines. Finally, as it turns out, the tunnel expansion is still listed among the possible capital projects the port is considering. 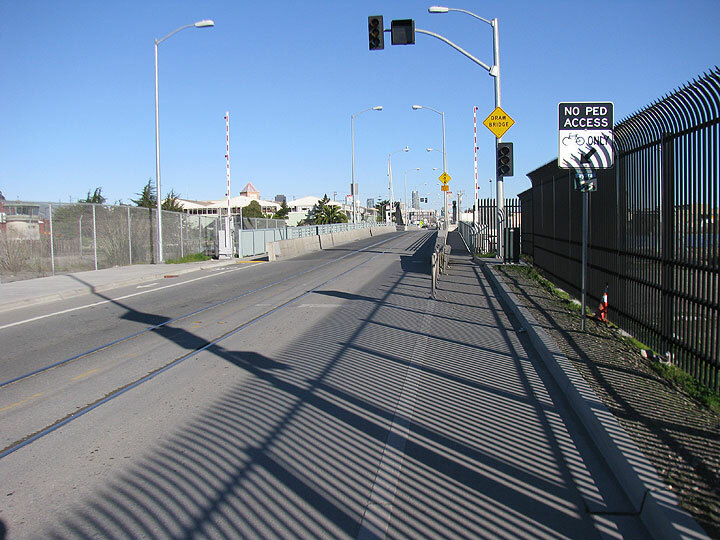 Illinois Street Bridge linking Pier 80 to Piers 94-96 across Islais Creek. There was one missing element in the port's pursuit of shipping and maritime businesses. During the 1990s, it had become obvious that the old argument that commercial development was needed to support shipping and maritime development no longer held water—there just was not much to support. This was underscored by Mayor Jordan, who asserted that commercial development should instead be used to bring people to the water, especially through shopping, entertainment, and recreation, and to finance maintenance of piers and other facilities. A few years later, this was a generally agreed-upon strategy, and was incorporated into the 1997 Waterfront Land Use Plan. So, the pursuit of industrial maritime activities has not been able to rely on potential income generated from commercial development; cargo operations in particular have had to fend more for themselves, financially speaking, and not on what happens in the northern waterfront. This also meant that the port could solicit commercial projects and focus on making the project work internally. That is, if the project met design parameters and could pay for required open space and other man- dated features, then "go for it" was often the attitude. But even this loosening of the financial noose would not be enough to jigger free some of the creative capacities of capital. That would take public-private partnerships, historic preservation tax credits, other public support for private enterprise and an earthquake. 1. Dennis Bouey as quoted in Tibbet L. Speer, "Waterfront Revival," San Francisco Business Times, April 4, 1994. 2. Tibbet L. Speer, "Waterfront Revival," San Francisco Business Times, April 4, 1994. 3. 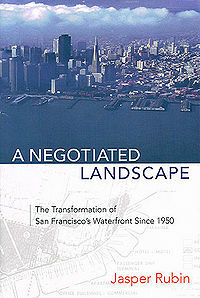 Port of San Francisco (PSF), Annual Report, 2004-2005 (San Francisco, 2005). 4. Gerald D. Adams, "S.F. Port's Tunnel Vision Gets Blaster," San Francisco Examiner, May to, 1995. 5. Recently, San Francisco has also been able to capture "special shipment" business, which includes transshipment of art exhibits and large scientific and research equipment, and has been trying to lure automobile shippers to its facilities. 6. Gerald D. Adams, "Port Abandons Plan to Renovate 2 Cargo Tunnels," San Francisco Examiner, February 2, 1995. 7. John King, "S.F. Port Veers from Shipping to Shopping," San Francisco Chronicle (SFC), January 23, 1995. King also quoted Jordan as saying "Pier 39—I like that. . . . It's one of the top retail developments in the country." Compared to his predecessors Jordan was quite conservative, and was notorious for his strong-arm approach to dealing with the homeless. 8. PSF, Annual Report. 2004-2005. 9. PSF, Annual Report, 2000. The increase in bulk shipping is strongly connected to the building and recycling industries; the latter has been particularly vibrant, at least until the economic downturn of 2008.